I found this cute idea on Super Ziper, and thought I'd give it a try. My crazy husband likes milk chocolate better than dark chocolate, so that is what I used. 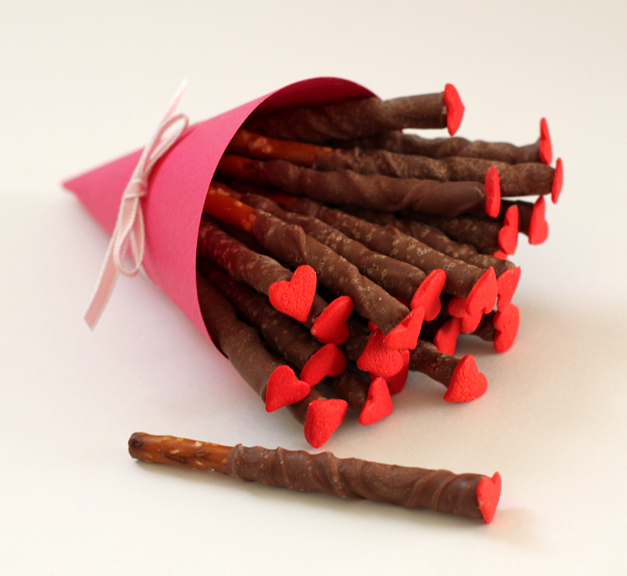 Chocolate dipped pretzel sticks with candy hearts on top. The pretzels are not quite flat on the end so the candy hearts kept sliding off, so I actually sawed off the tips. Yes, I sawed off the tip of each and every pretzel with a serrated knife so they would be flat. Then dipped in melted chocolate, and stuck the candy heart on the end. Since I didn't have any styrofoam without raw meat on it, I improvised and used a loaf of rosemary bread that I was about to throw out (because it was getting old). I just stuck those dipped pretzels right in for drying. Hopefully they won't taste like rosemary. Hopefully my hubby will think they are as sweet as I do. I made these a couple of days in advance, so the salt is starting to spot through the chocolate. So a little tip for you would be don't make them in advance if you want them to look perfect. Also, don't use a loaf of bread to stick them in. If you leave them there for a few hours, the ends start to get soggy. But they do crispen up again once removed. That's another lesson I learned. Just the sweetest idea! 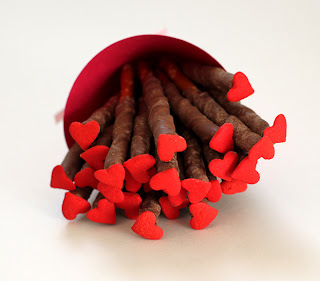 We all love chocolate covered pretzels and these little ones are such a great idea! These look fabulous, great tips about making them not too far in advance. Thanks!